JRiver Media Center is one of the most advanced media players available. 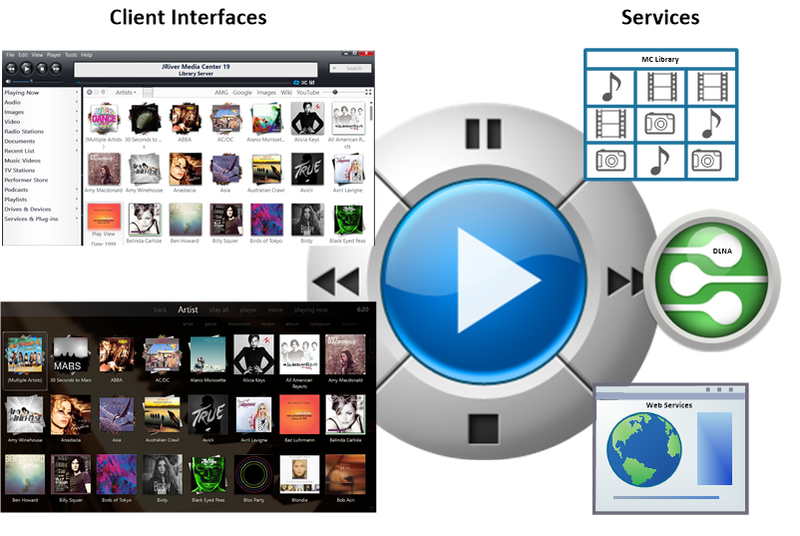 In addition MC also provides Media Network, a rich set of tools and features for moving your media around the network. Any media, any time, any place. Support for External Interfaces (see these links for more details on how to configure and use MC's Library Server, DLNA, Web Service Interface). These interfaces allow external devices to interact with Media Center as a Remote Control, Player, or Server. 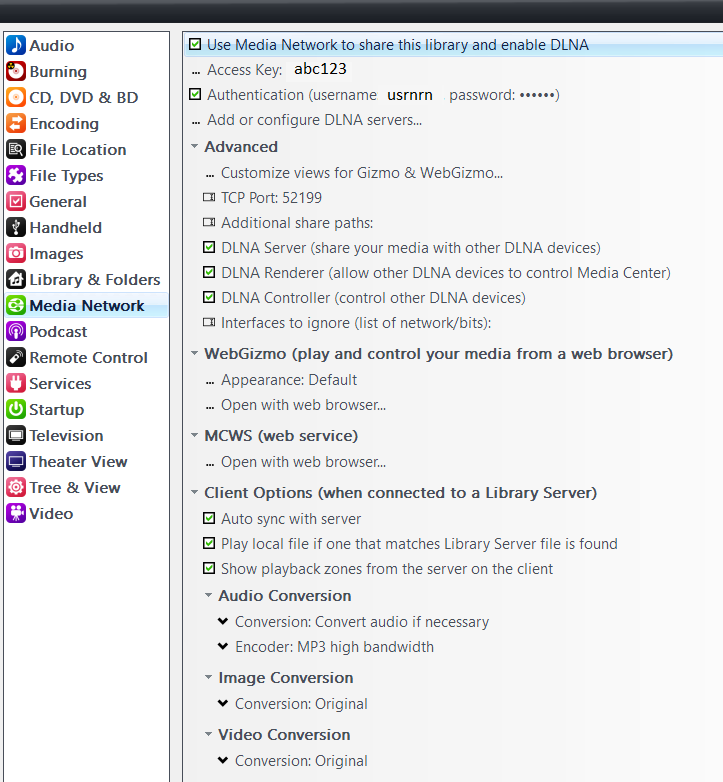 You can enable/disable and configure the various Media Network options under Tools/Options/Media Network. 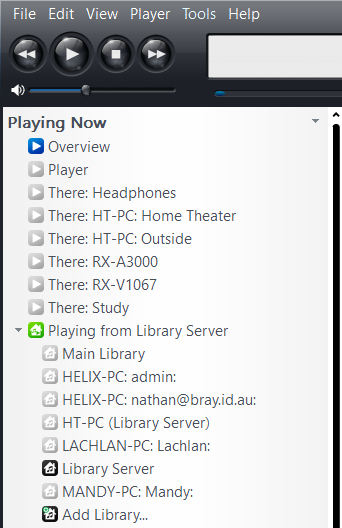 Media Center's Playing Now section will show both the available players and libraries that are available on the network at that time. You can select from what library you want to pull content from, and the player you would like to control and push the content to. The JRiver Id is an inexpensive, low power network device, available in several configurations. Remotes provides a list of the current Remote devices. Library Server outlines how to connect multiple MC Instances together in one integrated whole. DLNA support makes MC a perfect server for your new network capable TV or Blu-ray player. DLNA is a nice solution for serving media to a device, and it also provides the remote control. ZoneLink offers the ability to play the same content in multiple locations, including local hardware zones, or Media Network devices. Developers may find the Web Service Interface useful for writing applications that can control MC. Home Networking Examples contains some examples on how users are using MC and the Media Network Features. If you wish to use Media Center to play to other upnp/dlna devices on your network but they do not appear under playing now to play to, make sure that the local firewall (where MC is running) has port 1900/udp open for incoming traffic. This is the upnp discovery protocol and without it, MC won't see upnp/dlna devices on the network. This page was last modified on 15 April 2018, at 11:44.